The Connected Car is a clear example of digital disruption, affecting both products and business models within the automotive industry. New entrants such as Tesla and Uber are digital natives, and their business models are centered around the customer experience. In contrast, incumbents must change their business models (and supporting IT) from product-centric to customer-centric, with a strong services component. 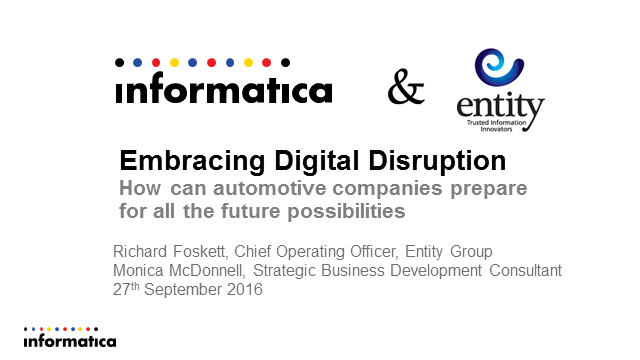 Most importantly automotive incumbents must revolutionize the way they manage the lifeblood of the digital age: data. In this webinar, Richard Foskett of Entity Group draws on his 30+ years in the automotive sector to discuss best practices for addressing common data management challenges in order to deliver an enhanced customer experience in a world of high digital expectations. Monica McDonnell and Richard Foskett with 30+ Years of Automotive & Data Management Experience discuss Disruption & Data. Presented by: Monica McDonnell and Richard Foskett with 30+ Years of Automotive & Data Management Experience discuss Disruption & Data.